The former police chief who launched the Philippine Government’s bloody war on drugs has asked for forgiveness from a Catholic archbishop over the thousands of deaths that occurred during his watch. Source: ucanews.com. Human rights groups claim more than 20,000 suspected drug users and dealers have been killed in President Rodrigo Duterte’s two-and-a-half year drug war. 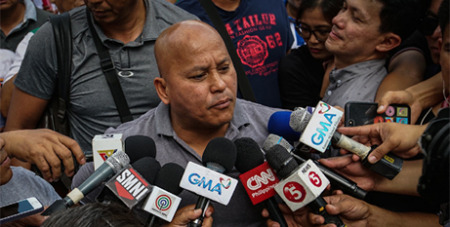 “I am asking for forgiveness for all those killed in our war on drugs because it [bothers] my conscience,” said former police general Ronald dela Rosa. In 2016, Mr Duterte handpicked Mr Dela Rosa to be national police chief. After Mr Dela Rosa's retirement in April last year, Mr Duterte named him director-general of the Bureau of Corrections. “Even though I was not the one who killed and shot them, I was the [national police] chief. It happened under my watch,” Mr Dela Rosa told reporters after meeting Archbishop Rolando Tria Tirona of Caceres on Wednesday. “I guess there is no bishop or priest who would say that they will not forgive you. [The bishop] will forgive me because he is a representative of God,” said Mr Dela Rosa. Archbishop Tirona could not be reached for comment on his meeting with the former police general.